When I visited the building site at No. 1 Grosvenor Square I was already familiar with the proposed plans for an upcoming residential conversion. Lodha UK, a subsidiary of Lodha Group, India’s largest developer, had announced that they were turning the former Canadian High Commission into an enclave for the world’s super-rich after purchasing the neo-Georgian building for £306 million in 2014. So when my taxi rounded the corner at Grosvenor Street I was taken aback. I expected to see the regal red brick building encased in scaffolding. But it had vanished. In its place, there was a fence that ran the perimeter of the site. It appeared that plans for a meticulous restoration had been displaced by something much swifter and more devastating. I craned my neck attempting to peer into the breach. Had the developers really torn the building down? “We needed to find a way of improving the building and giving it a long-term future,” says Justin Sayer, Associate Director at Eric Parry Architects, which is handling the conversion. 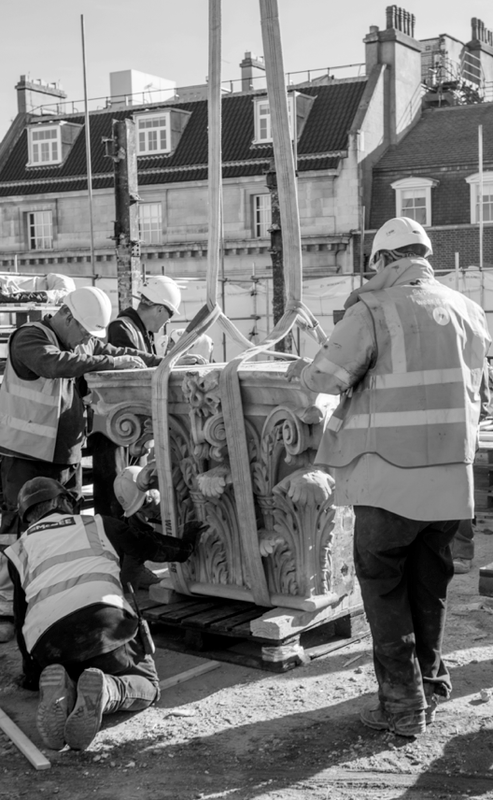 The London-based firm has worked on various challenging restorations throughout the city, and often to great acclaim. For the renewal of St Martins at Trafalgar Square the firm ingeniously extended precincts underground while adding transparency to the Baroque structure via a glass pavilion and an oculus that floods the foyer with light and air. At another commercial renovation at 1 Eagle Place in Piccadilly Circus, the firm was tasked with remodeling and combining five buildings, each with different floor levels. As a solution to the complex puzzle, the firm dismantled and re-assembled portions of buildings. Central Mayfair, which Justin refers to as, “the most important blue card in Monopoly,” has long been one of the city’s elite postcodes. And Grosvenor Square, located near Bond Street and Mount Street and five-star hotels such as Claridge’s and The Connaught has been known as the playground of the wealthy ever since Sir Richard Grosvenor, and ancestor of the Duke of Westminster, who still owns the square, built a row of fashionable homes in the early 18th century. But despite its illustrious past, first as a residence, then as an American and a Canadian Embassy, No. 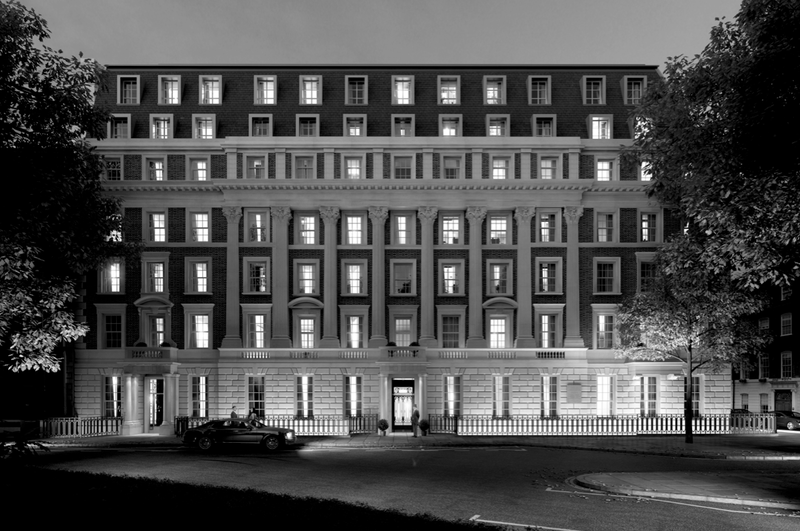 1 Grosvenor Square had become a bit tired and failed to meet current thermal and energy standards. An upgrade was necessary, and the architects looked at various options, including dismantling parts of the building and putting in a modern façade, but city planners rebuffed early proposals. “They said they didn’t mind changes as long as when you squinted the building looked like the original,” Justin says. But several complications prevented a simple restoration. First, the architects discovered spots where the bricks and stones were deteriorating due to what is known as ‘Regent Street Disease’, a corrosive condition, common among steel-frame buildings built prior to 1950, in which the stonework begins to crack. There was also an acoustic issue from a nearby Underground that they felt would be problematic for high-end residences. Eventually the architects proposed dismantling the building entirely to make the necessary upgrades before putting it back together again. In addition to the structural decay, the architects demonstrated that the existing building’s proportions didn’t reflect proper Classical architecture, and they suggested adding to the building, stretching it to create larger windows and ceiling heights. They also proposed building a new basement and setting it on springs to remove the vibrations from the Tube. This time, the planners and developers were convinced. 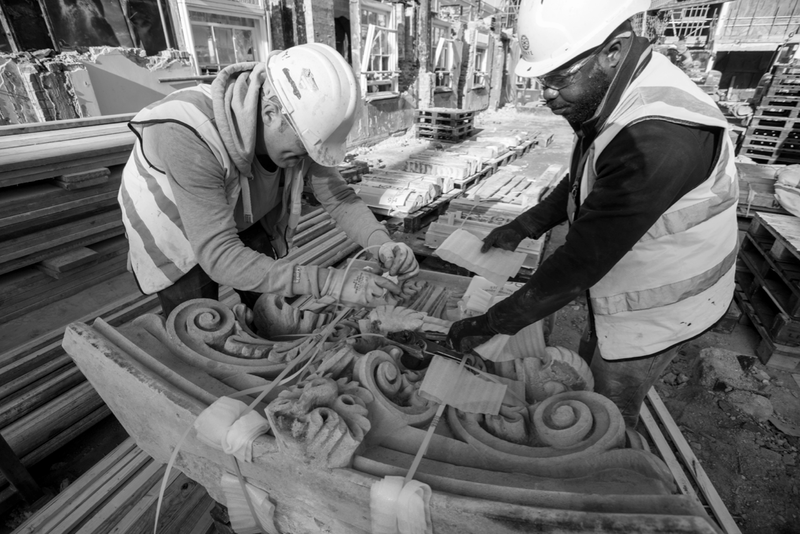 In addition to the original stone and brick, the building restoration needs to preserve other design details such as a reproduction of the Oval Office built by John F Kennedy’s father while the building was an American Embassy (1938-1960). The oval room will be incorporated into the grand entrance when the project is complete in 2019. And of course fresh details are being added as well. New windows chosen for their thermal and acoustic qualities, as well as 5,000 square feet of terrace space will connect residences with the outdoors, while expanded floor to ceiling heights will range from 3.1 to 4.2 meters -- the tallest will be found in the ground floor townhouses. In total the project will comprise 39 apartments and five duplexes. The architects have also added an 8,000 square foot ‘hidden’ penthouse that is set back and invisible from street level. The revamped building will also feature underground amenity spaces, including three levels of car park and a ‘lifestyle’ floor with a 25-meter pool, gym and spa. New York design duo Yabu Pushelberg, known for their savvy mix of art and artisanship, rich woods and sculptural furnishings, has been enlisted to design the interiors. So far property prices reflect the development’s painstaking efforts. Two-bedroom units start from £8 million, and to date, Lodha UK has concluded select pre-launch sales at over £6,000 per square foot. But of course, buyers here are investing in more than the latest luxury fittings -- they are purchasing a piece of history. 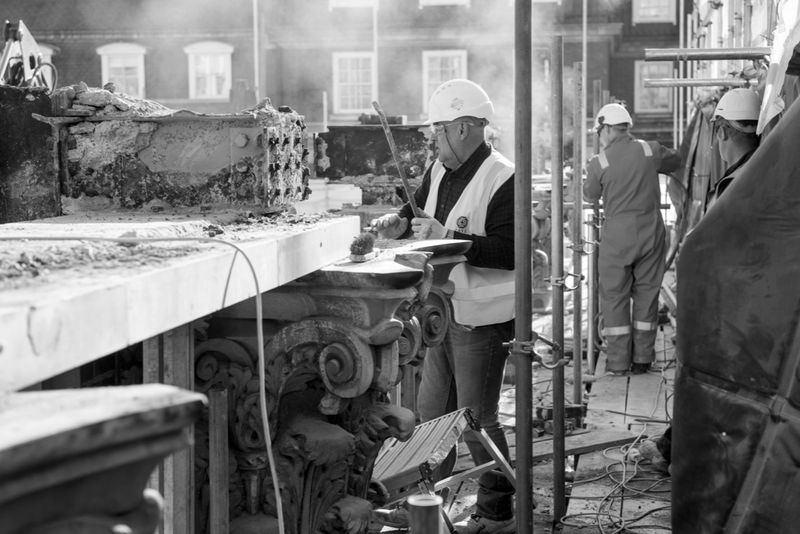 For hundreds of years Mayfair has been the epicenter of London luxury, and, after the meticulous overhaul is complete, residents will enjoy views of Grosvenor Square through their sparkling windows and find the leafy common largely unchanged.